Far to the west of the remote Indigenous community of Yuendumu, in the distant reaches of the Tanami Desert, lies one of the most important ceremonial sites for the women of the Warlpiri. Mina Mina is a sacred landscape made up of two large clay-pans guarded by a feathery sentinel of desert oaks, where, in the Jukurrpa (Dreamtime) a series of karlangu (digging sticks) emerged from the ground. Taking up these sticks, a large group of ancestral women began a heroic journey north to Jayinki and then eastward through Alcoota country. Marching in joyous exultation, their paths shaped the landscape, permeating it with the spirit of their songs. According to the Warlpiri, the spindly desert oaks at Mina Mina are an embodiment of these first digging sticks and of the ancestral women who brandished them. The story of Mina Mina is of profound spiritual sustenance to the Warlpiri. It helps explain the genesis of the landscape, and circumscribes their relationship to it. Despite being over 300 kilometres from Yuendumu, it remains an important site of ceremonial and custodial obligations. Not surprisingly, it has also been one of the great sources of artistic inspiration for Warlpiri women. At the hands of Yuendumu’s great chroniclers it has revealed itself in a myriad of ways: some artists have chosen to focus on the desert oaks (Kurrkara), others the hair-string skirts (Majarrdi) worn during ceremony, others still have focused on the edible fungus (Jinti-parnta) or vine (Ngalyipi) first collected by the ancestral travelers. Combined, these stories create a stunning vision of place, united by the indelible spiritual identification that is felt by the Warlpiri, and in particular those of the Napangardi/Japangardi and Napanangka/Japanangka sub-sections for whom this place resonates with personal significance. In contrast to the other early epicentres of desert painting, such as Papunya and Lajamanu, the painting movement at Yuendumu did not coalesce around senior men, but began in 1983 through the efforts of a group of senior Warlpiri women. Encouraged by the anthropologist Françoise Dussart, the women helped forge the dynamic ‘Yuendumu style’, which, as Judith Ryan has noted, was “characterised by vibrant colour, large brush-strokes and an almost messy, gestural freedom.” In 1985, the artists formed Warlukurlangu Artists Aboriginal Corporation, through which they have refined the style, adding a level of accomplishment and elegance, while retaining the intensity of colour and spontaneity of design that defined the early movement. 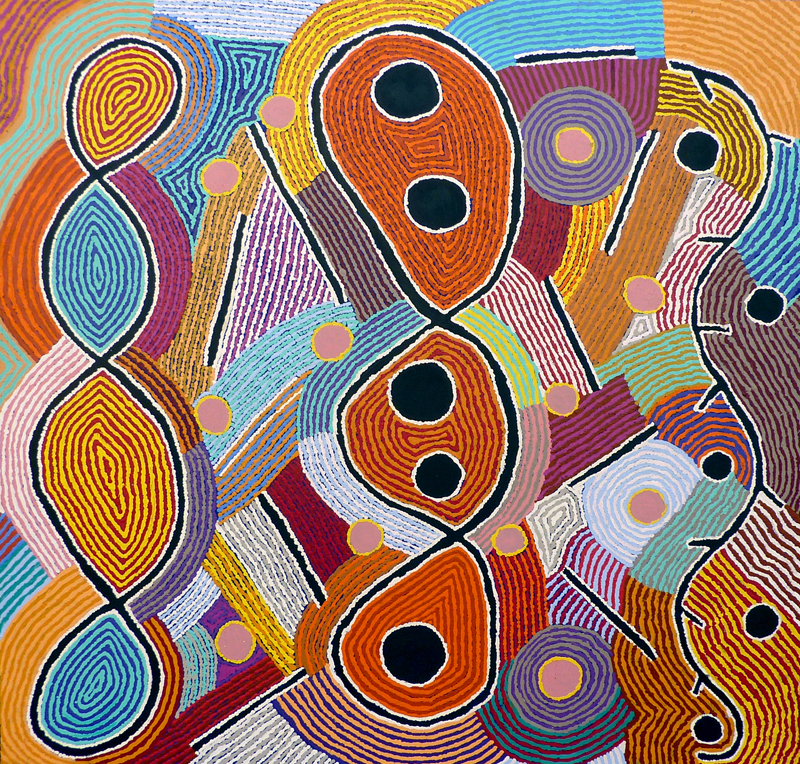 Subsequent generations of Yuendumu women have gained international acclaim as artists, including Maggie and Judy Napangardi Watson, Bessie Nakamarra Sims and Betsy Napangardi Lewis. 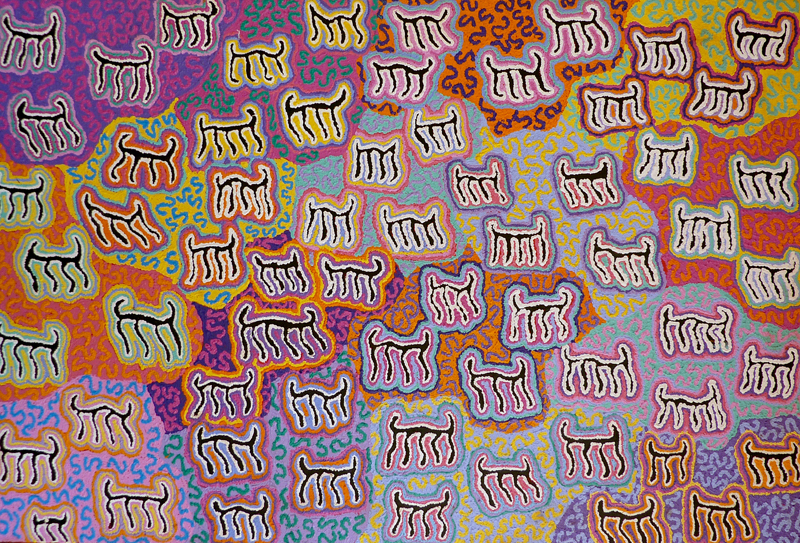 Despite generational change and aesthetic transformation, the presence of Mina Mina in Warlpiri art has remained an iconic constant. It is this legacy that is taken up in the paintings of Kelly Napanangka Michaels and Alma Nangala Robertson. Born in the late 1960s, Michaels (b.1965) and Robertson (b.1969) heard the Jukurrpa stories from their elders, and saw them painted with passion and dedication by their artistic forebears. Now they pass these stories onto their children and grandchildren, retelling them in a kaleidoscopic explosion of colour. 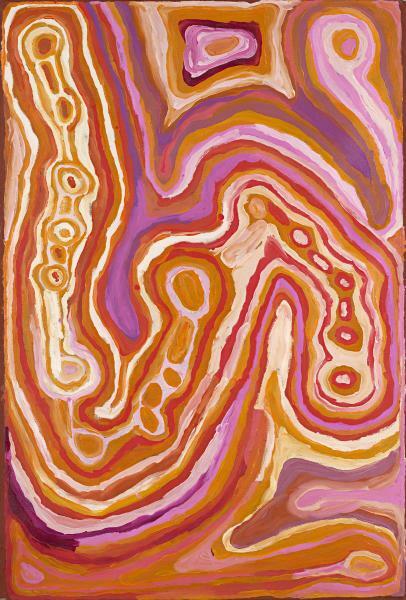 The influence of their elders runs through their work; the dominant iconographies of Warlpiri painting are clearly present, as is the characteristic Yuendumu palette of pink, mauve, purple and blue. However, this is not a slavish form of imitation. In the paintings of Michaels and Robertson, influence exists as an aesthetic undercurrent that bubbles to the surface like the spiritual residue of the ancestors that informs the landscape. The influence of their artistic precursors becomes a song that infuses the canvas, filling it with the authority of cultural continuity and uniting it with the performative actions of song and ceremony that connect the Warlpiri to the Jukurrpa. 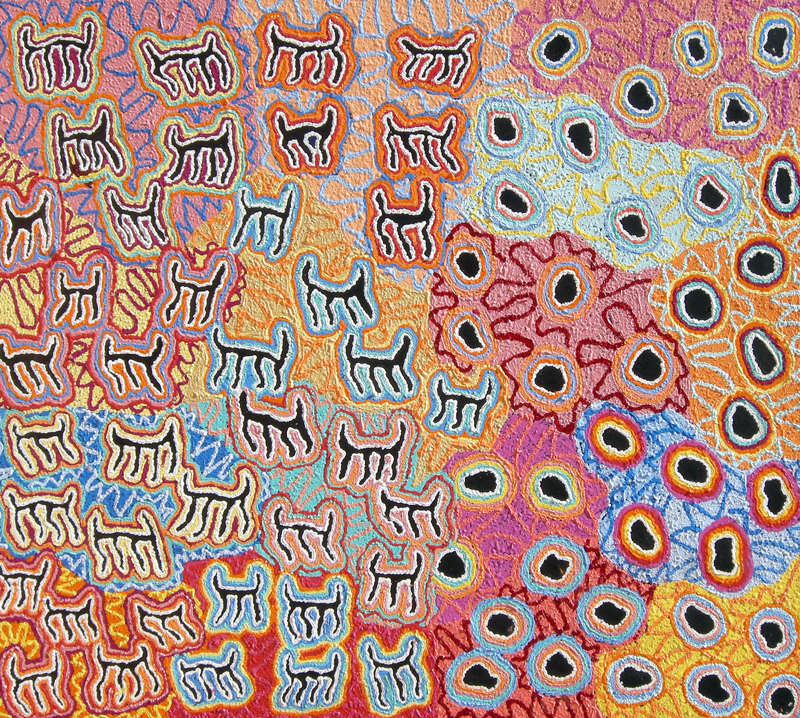 In Michaels’ depictions of Mina Mina, two key elements of the story dominate: the ceremonial dancing skirts (Majarrdi) and the edible fungus (Jinti-parnta) collected by the women on their journey. Majarrdi and Jinti-parnta are painted with a jutting angular intensity, which makes them appear to quiver across the canvas. Using extremes of contrasting colours (including a distinctive use of black and white outlines), Michaels creates a fluttering tension between foreground and background that makes the Majarrdi appear to float above the canvas as though suspended by invisible dancers. This creates an ethereal sense of spiritual presence, while the thickly painted ground of the canvas anchors them to the temporal materiality of the landscape. 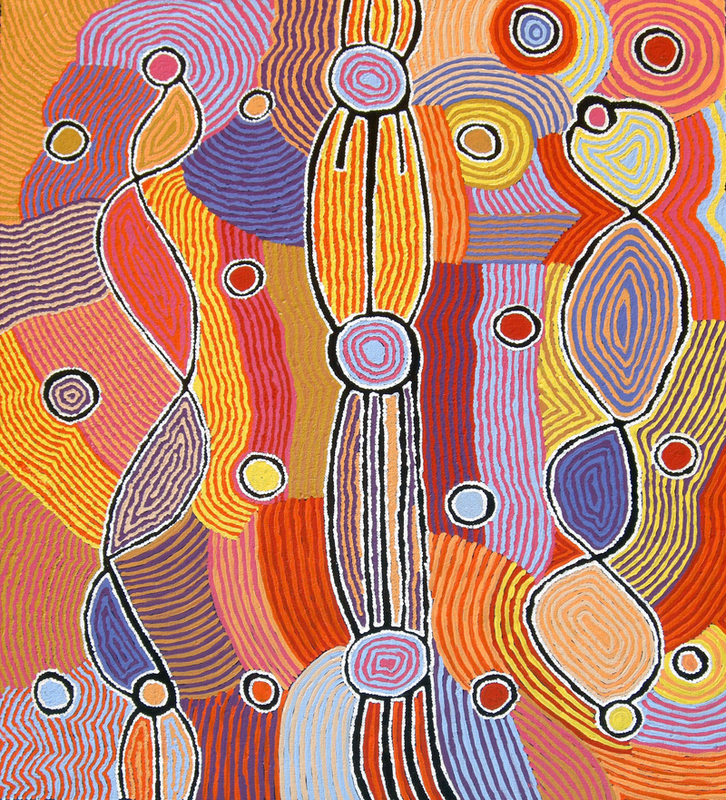 Like her artistic precursors, Maggie and Judy Napangardi Watson, Robertson’s focus is the sacred Ngalyipi vine and the desert oaks (Kurrkara). Her paintings are swirling evocations of the landscape that shuttle between the narrative of travel and the fixed nature of place. Meandering lines sink into the landscape, evoking the residue of ancestral travels that simmer below the surface. Mina Mina pulsates in a spiral of colour that alludes to the constant spiritual undercurrents of ancestral travels, which shape and inform this place. In drawing attention to this continuity of ancestral presence, both Michaels and Robertson testify to the continuing power of the Dreaming – a power that runs through all things, and unites all time and place. In their paintings, culture, aesthetics, history and place unite in a joyful continuum of colour and song. 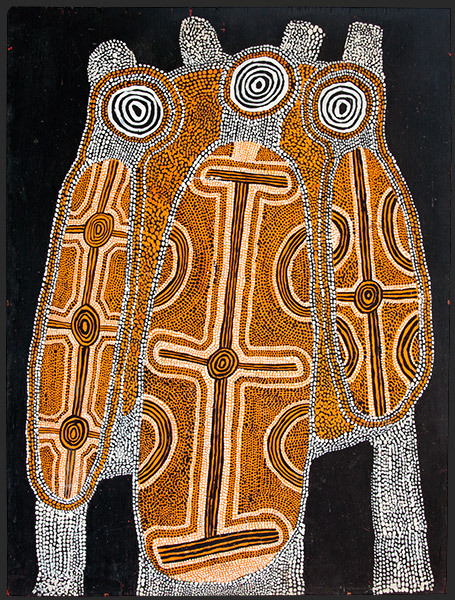 The Jukurrpa of Mina Mina is carried forward; its transformative power is expressed in an artistic evolution that pays homage to the past, while presenting a new vision for the future. On these fresh tongues, the exultant songs of the ancestral women are given new breath, proclaiming the creative power of Mina Mina for future generations. 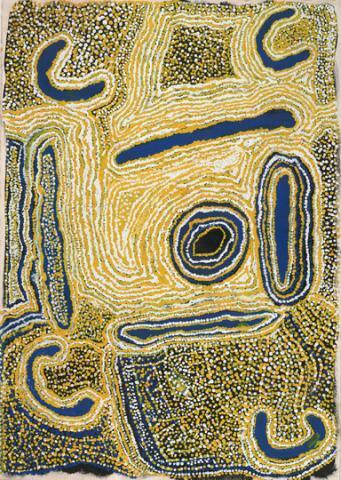 Judith Ryan, Mythscapes: Aboriginal Art of the Desert from the National Gallery of Victoria exhib. cat. 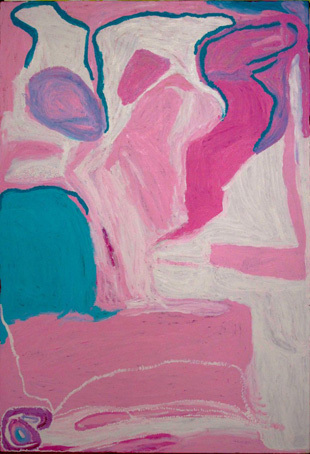 (Melbourne: National Gallery of Victoria, 1989), 69. According to the anthropologist Fred Myers, the Pintupi cosmos is divided into two contrasting spheres: that which is yuti (visible) and that which is tjukurrpa (Dreaming). The first of these categories, he argues, is phenomenal, the latter noumenal; one can be grasped with the senses, the other “outside human affairs and constitutes an enduring primary reality.” As everything in the Pintupi world is said to have originated in The Dreaming, a third term is needed to describe the passage between these two states – tjukurrtjanu mularrarringu – meaning literally, “from The Dreaming, it becomes real.” Thus, the visible and the Dreaming are inextricably linked, just as the stories in Pintupi paintings are said to be both tjukurrtjanu (from The Dreaming) and yutinu (revealed). Tjukurtjanu: Origins of Western Desert Art, curated by the National Gallery of Victoria and Museum Victoria in partnership with Papunya Tula, and showing at the NGV presents 200 of the jewel-like masterpieces of acrylic painting on board that emerged from the remote desert community of Papunya between 1971 and 1972. An analogy between the passage from tjukurrpa and yuti might be useful to describe these miraculous paintings, in which the once secret designs of ceremony and ritual were recalibrated into the new, self-contained and secular aesthetic of acrylic on board. 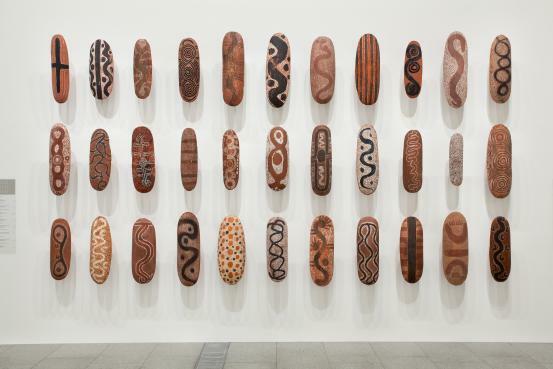 If the exhibition’s title stakes an immediate claim to locate the origin of this movement in the metaphysical realm (tjukurrpa), the exhibition itself is more concerned with the tangible processes by which it was made visible in paint (yutinu). One of the most remarkable achievements of Tjukurrtjanu is how convincingly and comprehensively this emergence is contextualised. 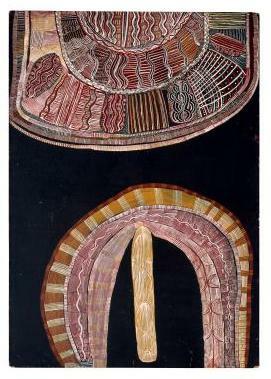 The early paintings are situated amongst a sumptuous trove of ethnographic material – including photographs, video, decorated shields, spear-throwers, ceremonial ornaments and pearl-shell pendants – all carefully chosen to reveal the pedigree of the iconographic lexicon from which the Papunya artists drew. Moreover, in the handsome exhibition catalogue, a series of nuanced essays tease out the complex agglomeration of social, historical, cultural, economic and personal factors that catalysed the emergence of desert painting at Papunya in 1971. 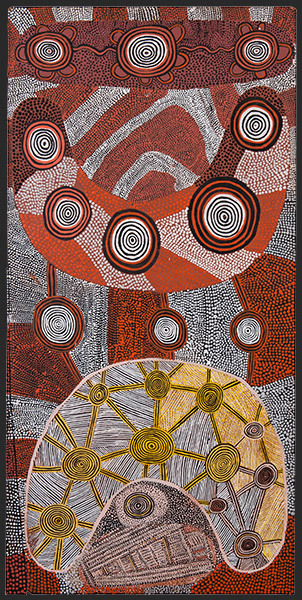 If, on the one hand, this wealth of archival evidence serves to show that the emergence of painting at Papunya was not a hermetic moment of artistic epiphany, it in no way detracts from the substantial artistic achievements of this small, pioneering group of artists, nor does it dampen the extraordinary aesthetic power of the paintings gathered in Tjukurrtjanu. A comparison between the paintings and the decorated shields is revealing: although they speak in the same iconographic language, their poetry is radically different. In one sense, the reason for this difference is self-evident. In ceremony, the meaning of decorated objects such as shields or tjurunga was not autonomously visual, but generated in conjunction with a series of other systems of meaning production that included song, dance, performance or ritual. The first problem of acrylic painting was how to distil this complex accumulation of meanings into the autonomous zone of the two-dimensional picture plain. The second, more culturally specific problem was how to display this information in a way that did not contravene the strict Pintupi hierarchies of secrecy and revelation. The early painters at Papunya generated considerable controversy over some of their choices of image and motifs, which were deemed to transgress what could be safely represented. Critical opinions on the reasons for such transgressions are divided. In the exhibition catalogue Fred Myers mounts a convincing argument that the artists were simply overly-eager to explore the possibilities of this new medium, while John Kean suggests that it was partly due to the pioneering artist Kaapa Tjampitjinpa’s personality as a maverick prepared to transgress social mores. These experiments are stunningly displayed in Tjukurrtjanu. Each of the twenty artists included is represented with multiple, fine examples of their early work, allowing us to compare both their artistic differences and their individual development of distinctive motifs, styles and iconographies. It is here that we can see the true greatness of these artists, as they each grapple with different conceptual and aesthetic difficulties posed by the translation of traditional iconographies into masterpieces of contemporary art. The sheer inventiveness of these responses is breathtaking. The meanings that these paintings express are necessarily difficult for us to grasp – they come from a tradition and worldview that is markedly different to our own. However, this process of experimentation reveals a group of artists using every available aesthetic mean to create cross-cultural explanations of their complex cosmology to an ignorant white audience. Whether out of calculation or exasperation, the medium that these artists chose for this explanation was painting. In doing so, they chose a means of communication that was insistently and undeniably pictorial. If we accept the meaningfulness of this pictorial representation, then it is surely in the systematic refinement of this pictorial message that the best clues to its meaning must lie. It is in this space that the genius of these artists is revealed through their ability to bring The Dreaming into view, to transform tjukurrpa into yuti, and to make compelling contemporary visual statements from an ancient conceptual schema. Tjukurrtjanu offers a rare opportunity to see these seminal works en masse in order to fully assess the magnitude of their aesthetic and conceptual achievements. This masterfully curated exhibition offers the chance to witness a moment of profound brilliance when all the majesty of ancient traditions were condensed into some of the most extraordinary paintings ever produced in this country. The fact that this movement arose as an aesthetic olive branch stretched across the cultural divide only serves to magnify the munificence of this gesture. Fred Myers, Pintupi Culture, Pintupi Self: Sentiment, Place and Politics among Western Desert Aborigines, Smithsonian Institution Press, Washington, 1986, pp.48-52. Fred Myers, ‘Intrigue of the Archive, Enigma of the Object’, in Judith Ryan and Philip Batty (eds. ), Tjukurrtjanu: Origins of Western Desert Art, exhib. cat., National Gallery of Victoria, Melbourne, pp.30-31. John Kean, “Catch a Fire’’, in Judith Ryan and Philip Batty, op. cit., pp.48-50. Judith Ryan, ‘Aesthetic Splendour, Cultural Power and Wisdom: Early Papunya Painting, in Judith Ryan and Philip Batty, op.cit., p.18.